Susan J. 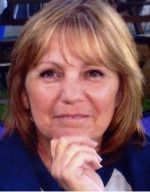 “Sue” Gomber of Allegan, Michigan, passed away Tuesday, January 11, 2011 in Allegan. Susan was born March 30, 1951 in Plainwell to Lester and Patricia (McDonald) Goudy and was a lifelong resident of the area. For 32 years she provided day care in her home in Otsego and then for 15 years was employed with Perrigo Co. Sue was a very giving person. She enjoyed cooking, baking, cleaning, flowers and trips to the casino. Above all else she loved her family. Surviving are a son and two daughters, Doug (Julie) DePauw, Leslie DePauw and Nikki Gomber all of Otsego; two granddaughters, Chelsea and Brooke DePauw; her father, Lester “Sam” Goudy and his partner, Jane Tice, of Otsego; a sister, Vicki Doubblestien of Kalamazoo; a brother, Mike Goudy of Allegan; her life partner, Larry Rassmussen of Allegan; her former husbands, Randal Gomber and Robert DePauw; several cousins, nieces and nephews. She was preceded in death by her mother, Patricia Goudy, in 1998. Friends may meet with Sue’s family from 5 to 8 P.M. Friday at the Winkel Funeral Home, Otsego, where funeral services will be held at 11:00 A.M. Saturday, Funeral Celebrant Bill Rose officiating. Burial will follow at Mountain Home Cemetery, Otsego. Contributions in memory of Sue may be made to Wings Home.